Take a stance against baiting nerd rage and stereotypes of geeks. Post about how much you love your geeky hobbies or vocation from Monday, September 12th, 2011 to Friday, September 16th. Let’s show the world why we’re awesome and why there is nothing wrong with being a geek. As a teenager in the 1990’s, I grew up in the era of who could care less. A strange time, surely. Cynicism and disinterest were the only appropriate ways to view our nihilistic world. We were slackers and losers by design. Except the geeks. Geekism is unreserved love, active joy. Never mind the fact I couldn’t throw a spiral and loved computers — I actually cared about things. Geeky things. And I didn’t care who knew. Now, I had the good fortune to grow in a little town in southern New Hampshire. In the 1970’s, a couple tech giants set up shop in that rural region, causing an influx of engineers and software developers. You know: geeks. Original geeks. I made friends with the geek kids of other geek parents. I managed to avoid much of the alienation and abuse that plagues young geeks in most places. When it did happen, which was often enough, I had a group of friends to fall back on. And for this, I am fortunate. On to the topic at hand. My geeky hobby of choice: retro-gaming. I wrote this post a while back, and can’t help but share it again. “Retro-gaming” is a highly-mutable term. Pulling out the tangle of cords that is your old Atari 2600? Retro-gaming, certainly. Blistering your fingers on that old NES controller? Sure. But how about the PS one? The Gamecube, even? Semantics aside, there can be no doubt that logging some time with Super Star Trek counts as retro-gaming. Yes, that’s an actual screenshot. A far cry from this, yes? I first heard about SST when I was a young kid and my dad would tell tales of playing it on some massive old rig at work. (“During breaks”, of course.) Various incarnations of this game could be found on various boxes and home computers throughout the seventies. It was distributed for home use the old-fashioned way – by publishing the complete BASIC code in a magazine. A few hours of careful transcription and you were ready for… what exactly? What on earth would motivate a modern gamer to keep playing this thing after a few curious moments? Sure, download a new version, tool around a bit, have a laugh. But to actually play? What could this code-snippet possibly have to offer? #1 – Turn-based play. Sure, it’s still out there, even on consoles, but there’s not much of it around. 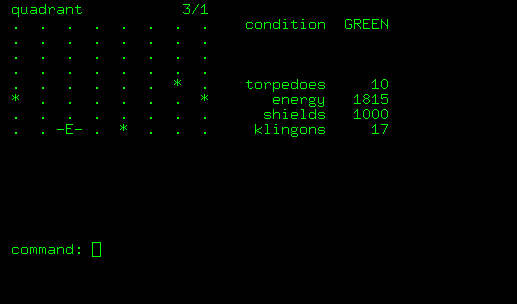 Spending some time with a game that allows you to leave it alone for a few hours while you consider whether or not you want to use your last photon torpedo on that distant klingon warbird (represented by a capital “K”) has a completely different feel. SST combines tactical turn-based play with the map size and freedom of a larger-scale strategy game. #2 – Randomness. As you direct the Enterprise (that’s the “E”) around the charted galaxy, just about everything can go wrong. You are quite often yanked across the board by a “tractor beam” and placed in the middle of a firefight – not good if you’re on your way to a starbase (“B”) to reload. Sometimes the transporter will just flat out fail without warning, and the last sound your away team will hear is Scotty wailing that he’s losing them. A star (“*”) in your sector can go nova and toss you across the map like an empty can of Tab. Etc. And when I say “etc”, I mean it; much of the strategy in this game is focused on how to prepare for the worst that merciless random-number-generation can deal out. #3 – The promotion system. Every lasting game needs a rewards system, and in SST it comes as a notification that you have been promoted to the next difficulty level. Sure, you could start at the hardest setting or keep on riddling away at the easiest, but getting the word that you have saved the Federation and are ready for harder trials makes the challenge all the more fun. When the player reaches the Expert level and scores well enough, the program will print a plaque. That’s right – something you can hang on your cube wall to show the world how awesome you are at Super Star Trek. Smitty over in networking will never live it down. This entry was posted in Uncategorized and tagged retrogaming on September 16, 2011 by gala5931. Saw a news story today about how companies are losing money due to employees distracted by angry birds. We geeks certainly were distracted and occasionally obsessed by Super Star Trek, but thirty years later, what would have been an obsession for geeks then is now a productivity killer for people who can barely spell OS4 let alone understand the computer science or electronics engineering behind it. To echo a phrase from one whom I love, respect and admire…. What a time to be alive. …. And congratulations on the second anniversary of your achievement ….